Well I'm not ready to paint yet, but I am thinking of doing a takeoff from the Extra300. I used to compete with a giant scale R/C model of one of these, and I recently got the ride of my life in a full scale one. I even opened up a couple full scale air shows with my R/C performances for Pratt and Whitney in Hartford. 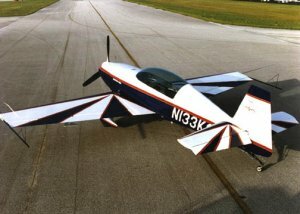 This Extra300 has a special place in my heart because of the air shows I used to put on with my 1/3 scale R/C. I once did a performance with some music and the huge crowd went wild. I even made a woman cry as she watched the graceful ballet of my Extra300 flying a routine to Yanni music. She came up to me after the flight, teary eyed, and told me it was the most beautiful thing she had ever seen. I'll never forget her. It was awesome. The music was great, the routine was perfectly matched to the music, the plane was big and beautiful, and well... my flying was not too bad either. I hope to fly that routine again one day, In my homebuilt RV-6A, with Yanni playing in my headsets. I'm thinkin maybe Ill leave out the inverted flat spins, snap rolls on take off, and the tail slide to 1 ft off the deck? You think? Let me know what you think of this paint scheme. Is this not a spectacular paint scheme or what? Well I have begun the painting process on the wings and fuse. The key of course is prep work. For filler I used Evercoat 100400 filler obtainable from any body shop store. Dries in minutes and sands quickly and easily. Fill all smilies, pop rivets and any imperfections. A scotchbright wheel on a die grinder makes quick work of the task. Here is my bud Scott getting a flap ready to shoot the primer on. I am using Dupont Variprime self etching primer on all the aluminum. followed by Imron top coats to be done in a month or so when I am ready. You can only wet sand the primer so get the surface ready first. Fill dents, buff scratches, wipe entire surface with MEK, and shoot. Here are all the pieces done and ready to head for the hanger. Be ready for the primer to show every imperfection you could not see before. It is clear now that this will NOT be a show plane. My riveting, seams, panel overlaps etc. do show a rookie at the wheel. Oh well... I consider her to have character now with my own flaws now in the plane permanently.